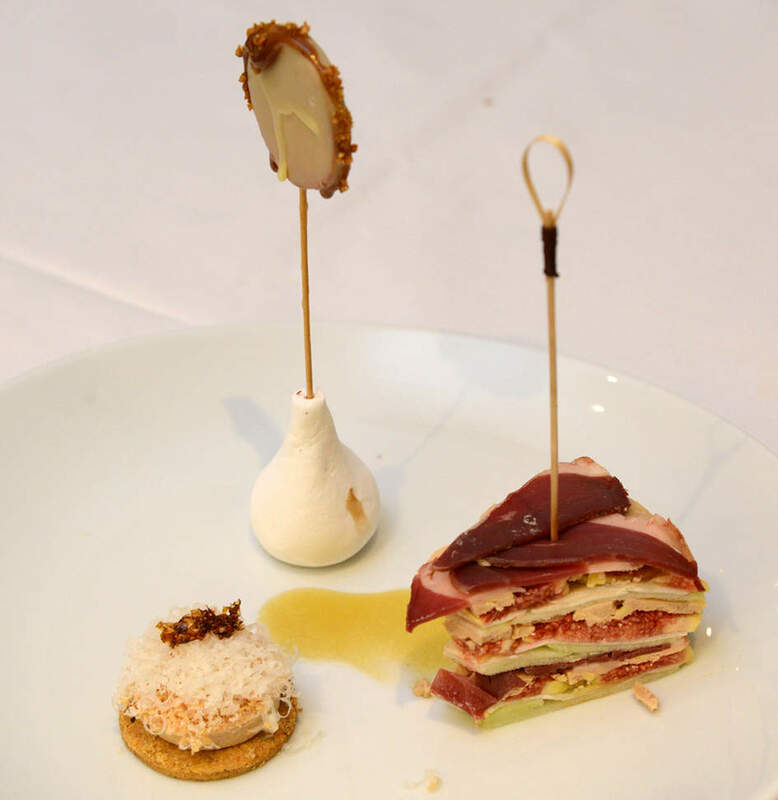 Quentin Boeglin, won the Foie Gras Challenge! Make cool chicken stock. Add the previously soaked and drained gelatin. Mix the Foie Gras with the cooled chicken sauce and the whipped cream. Spread in the semi-spherical cells of 3 cm in diameter of a flexible mold. Freeze 2h. Prepare the shortbread pastry with all the ingredients. Spread it out between two sheets of greaseproof paper. Cut in 5 cm diameter circles. Bake these 12 min at th.6 (180 ° C). Book the rest of shortbread pastry for another use. Unmold a sphere of Flash-frozen Foie Gras on cold shortbread biscuit and let it defrost. On the top, grate some parmesan then Flash-frozen Foie Gras. Cut the semi-cooked Duck Foie Gras into thin slices. Place the slices on a filmed plate. Put them in a freezer to solidify them. Remove the fat from the duck breasts and leave only 1 mm. Peel the figs and the cored apples. Clean the mushrooms. Cut them into regular slices In a circle of 16 cm in diameter out the slices in rose by alterning the layers (apples, mushrooms, figs, Duck Foie Gras, Duck Breast). Press and let them in a fridge to solidify. Cut the cake and plant a pike in each. Cut the semi-cooked Duck Foie Gras into slices, and thanks to a pastry cutter cut them into 5 cm diameter circles. Plant a pike in each. Put them in the freezer to solidarify, put them in the melted cocoa butter (40 ° C) and wrap the roasted and chopped hazelnuts. To finish bound with caramel, and plant the soother in a holder.